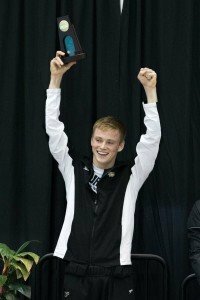 The final prelims session of the 2015 men’s NCAA Championships is upon us, and the torrid pace of outstanding swimming shows no signs of slowing down. This morning’s prelims will be a relatively quick session, with just four events set to go off. Things will open with the 200 back, where Cal’s Ryan Murphy is the top seed, and on the warpath towards the American record. That national mark currently belongs to Ryan Lochte at 1:36.81. Murphy was a half-second off that mark last season as a freshman. The 100 free is one of the more intriguing matchups of the meet so far. In a collision of pure speed and elite endurance, 50 free champ Caeleb Dressel will meet 200 free champ Cristian Quintero. Dressel, a Florida freshman, nearly became the fastest American ever in that 50 free, while Quintero went 1:32 in the 200 free in three separate swims yesterday, including two finals races (the 200 free and 800 free relay) separated by only a few hours. The middle 100-yard distance will be a real test for both men. Does Dressel, training in Florida’s notoriously high-yardage program, have the endurance to take home the win? Or will Quintero, well-known for pushing the pace early in his mid-distance races, find the speed to top Dressel? The outside contenders would be Alabama’s Kristian Gkolomeev, who split a wicked 18.2 on the 200 medley relay last night, or NC State’s Simonas Bilis, a relay machine so far for the Wolfpack. Arizona’s Kevin Cordes silenced the doubters with a big 100 breast win last night, and he’s far and away the best 200 breaststroker in NCAA history. He’ll look for his 7th individual NCAA title in 4 years in the 200 today. Georgia’s Nic Fink and Texas’s Will Licon should also be in the mix. But today really saves the best race for last: the 200 fly pits last year’s champ and NCAA record-holder Dylan Bosch of Michigan against Texas’s recent American record-breaker Jack Conger, with Longhorn 100 fly champ Joseph Schooling lurking in the shadows. Those three will each lead a circle-seeded heat this morning. Expect national records to fall in the event at some point today, perhaps even in the morning session. We’ll also see prelims of the 400 free relay, where top-seeded NC State looks to bounce back after DQing their national champion 200 free relay on day 1. Expect defending champs Auburn to be in the mix, and Southern Cal leads the other circle-seeded heat a day after their impressive 800 free relay victory. We’ll see the early heats of the timed-final 1650 free go this afternoon, with the top 8 seeds swimming with the finals session tonight. Northwestern’s Jordan Wilimovsky is the top seed, looking to give the Wildcats their first NCAA title since the Matt Grevers era. Keep refreshing this page for event-by-event updates live from Iowa City, and follow along with every beat in the action on our new live Twitter account, @SwimSwamLive. Cal’s Ryan Murphy looked incredibly controlled this morning, leisurely coasting away from a loaded final heat in the closing 100 yards to take the top seed heading into tonight’s final. It’s been a busy week already for the sophomore – this was his 9th swim since Thursday morning. His 1:38.65 makes him the top qualifier by just enough. Tennessee’s Sean Lehane won the first circle-seeded heat, and is a tenth behind Murphy at 1:38.76, and the other circle-seed heat winner, NC State’s breakout freshman Hennessy Stuart, sits third in 1:39.60. An incredible 7 swimmers got under 1:40 this morning, nearly the entire A final. Stanford senior David Nolan was just a tick behind Stuart in his heat, going 1:39.66. Murphy’s heat yielded the next two qualifiers, with Brigham Young’s Jake Taylor going 1:39.76 and 2013 NCAA champ Drew Teduits 1:39.85. Cal put two guys into the A final with Murphy and junior Jacob Pebley (1:39.87). The final championship heat swimmer will be Auburn’s Joe Patching, who was 1:40.16 this morning. Penn State’s Nate Savoy (1:40.25) and Missouri’s Carter Griffin (1:40.31) are just on the outside looking in, leading the B final in 9th and 10th place, respectively. That was a tough event for Texas, with the current points leaders only putting Will Glass into the B final. In the battle for third behind Cal, Michigan put two into the B final (Tristan Sanders and Aaron Whitaker, both freshmen) to best Florida, which has no finalists. NC State’s Simonas Bilis won the first of the circle-seeded heats, and his 42.18 held up over the final two waves as the top seed. Bilis and the Wolfpack have had an up-and-down meet, coming back after DQ difficulties in the 200 free relay to take second in last night’s 800. Bilis will have a hand in both of NC State’s freestyle title opportunities tonight, leading this event and swimming on the team’s top-seeded 400 free relay. Alabama’s Kristian Gkolomeev won the final heat to jump to #2 overall, going 42.23. That just touched out USC’s Cristian Quintero (42.26), and Quintero winds up tied for 3rd overall. Tying Quintero was Michigan’s Bruno Ortiz, who rocketed to a heat win from lane 3. The Wolverines appear to have really showed up to swim this morning, and look to be winning the battle with Florida for second place. Ortiz was 42.26 as well. Texas gets their first A finalist of the day with junior John Murray, who went 42.27. A couple of Pac-12 rivals follow him in the seeds, wtih Utah’s Nick Soedel going 42.31 and Cal’s Tyler Messerschmidt hitting 42.32 from an early heat. The last championship finalist is Missouri’s Michael Chadwick who went 42.37. That bumps out Florida freshman Caeleb Dressel, who was among the contenders to win this event after taking the 50 free on day 1. 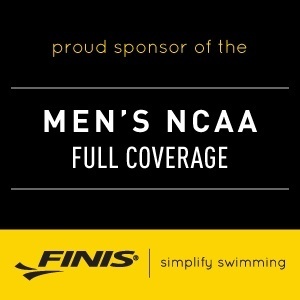 Dressel gets bumped to 9th in 42.39, and will lead the B final along with Georgia Tech’s Andrew Kosic (42.42). Texas and Cal each have 1 swimmer up and 1 down. That’s essentially a win for Texas, as the Longhorns only have to match Cal to coast to a team win. Michigan continues to charge with 1 up, Florida has just 1 down, and USC led all teams with 1 up and 2 down. The rise of Will Licon continues. Texas’s versatile breakout sophomore became just the second man in history to break 1:50 in the 200 breaststroke, beating the first man to do it in a head-to-head heat race. Licon trailed American record-holder Kevin Cordes of Arizona early, but took off in the back half to go 1:49.54, the fourth-fastest swim of all-time behind 3 Cordes races. In a meet full of pleasant surprises for Texas, none has been as impactful as Licon, who won the 400 IM last night and took second in the 200 IM on day 1. For his part, Cordes looked extremely relaxed, never breaking from his trademark long-and-powerful stroke. 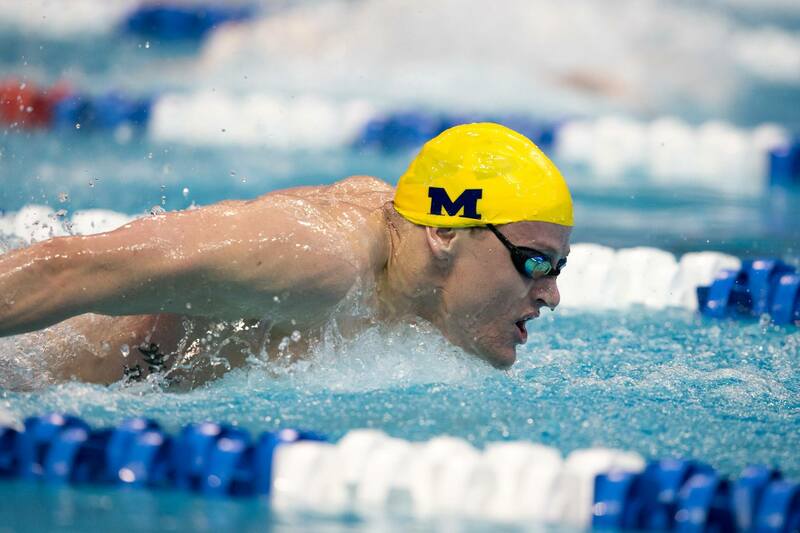 Cordes was swimming just four strokes a lap until the final 75 yards, and finished in 1:50.02. After he showed up big in the 100 last night, fans will be reluctant to pick against him in the 200, the event where he’s been basically unstoppable over the past few years. Cal’s Chuck Katis continued his outstanding senior season by winning his heat in 1:50.71 – that check in as the 7th-fastest swim of all-time and makes him just the third man to break 1:51, joining Cordes and Licon. Missouri’s Sam Tierney won his heat with a 1:51.78 and check in as the 4th qualifier. Tierney was 4th in the 100 breast last night as well, tying for the highest finish in Mizzou program history. The dark horse to watch tonight is Georgia’s Nic Fink, who finished second to Katis in the final heat. 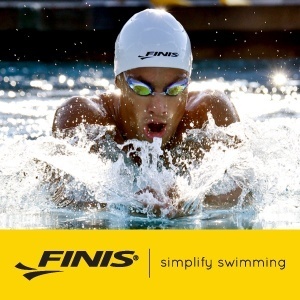 Fink, continually the forgotten man behind the record-breaking Cordes and the flashy breakout swimmers Licon and Katis, moved up to take second in the 100 breast last night and could be a contender to break 1:51 or event 1:50 tonight. Alabama’s Anton McKee broke through with his first A final spot of the meet, going 1:51.97 fro sixth, and Michigan’s Richard Funk and South Carolina’s Nils Wich-Glasen tied for the the last two lanes in the championship final at 1:52.60. With Funk getting in and Florida’s Eduardo Solaeche only taking ninth, Michigan continues to win the battle for third place. Solaeche was 1:52.67 and his teammate Matt Elliott is 11th in 1:52.76. Also in the B final with them is 10th-place Thomas Dahlia of Louisville. Cal continues to show up this morning, putting one up and one down compared to just one up for Texas. Michigan has one up compared to two down for Florida, and USC posted just one into the B final. The hype has all been about Texas’s duo of Jack Conger and Joseph Schooling, but defending champ Dylan Bosch put his name atop the prelims results. You could tell Bosch was motivated from the get-go; after what’s been a somewhat lackluster meet for him so far, Bosch was 1:40.15 this morning, keeping his intensity and stroke rate up the whole way. That’s eight tenths off his NCAA record set last year. Conger will be very much in the hunt, though. The Longhorn was 1:40.97 to win his heat, and clearly felt he could go faster based on his post-race reaction. Conger finished and was shaking his head before even looking at the scoreboard for his time – he looked smooth the whole way, but shortened up just enough over the final 50 yards that he couldn’t match his 1:39.31 from a time trial before the Big 12 Championships. He’ll be followed by two teammates as Texas continues to rule the butterfly events here in Iowa. 100 fly champ Joseph Schooling was 1:41.15 to win his heat and qualify third, and 500 free winner Clark Smith is back to compete in this event, going 1:41.59 this morning. Missouri senior Mack Darragh qualified fifth in what’s been a solid morning for the Tigers. Darragh was 1:41.76. Another team having a strong prelims session is NC State, who will be represented by Christian McCurdy (1:41.99) in tonight’s final. 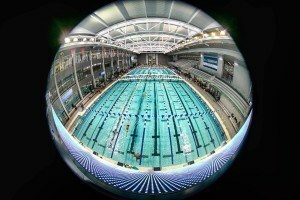 Georgia’s Tynan Stewart is the 7-seed, going 1:42.08 this morning. Meanwhile Cal’s Adam Hinshaw blasted another huge, momentum-boosting prelims swim from an early heat – that’s been his MO all week – and jumped into the A final with a 1:42.13. Hinshaw also made the 400 IM’s A final after coming in seeded well outside of the circle seed. He earned that spot by just a hundredth of a second over senior teammate Will Hamilton (1:42.14). Hamilton will lead the consol heat alongside Georgia’s Pace Clark (1:42.41). Michigan, Florida and USC each put one swimmer into the B final as those teams continue to jockey for spots 3 through 5 in the team rankings. USC remains red-hot in the relay events. The Trojans blasted to a runaway win in the opening heat, going 2:48.24 to eventually take the top qualifying spot. For a morning swim, that relay was outstanding, featuring two 41s and a 42-low. Cristian Quintero led off in 42.40, and the middle two legs were 41.86 (Santo Condorelli) and 41.82 (Ralf Tribuntsov). Dylan Carter anchored in 42.16. Two heats later, though, Cal fired back with a 2:48.28 of their own, just four hundredths behind the Trojans. Cal had a blazing 41.46 from Ryan Murphy on the second leg, and Seth Stubblefield went 41.83 anchoring. It’s been a disappointing meet for Stubblefield, but the senior will have the potential for one last high-impact swim on this relay tonight. Also racing for Cal were Fabio Gimondi (42.30) and Tyler Messerschmidt (42.69 leadoff). Both the Golden Bears and the Trojans were under Auburn’s winning time from last year. NC State is third in 2:49.18. They’ve been really focusing on relays this week, scratching out several individual swimmers to keep their relay teams fresh, and it paid off with a second-place finish in the 800 free relay last night. Simonas Bilis anchored with the field’s best split of 41.24 this morning, trying to run down Cal for the final heat win. The Wolfpack also had Ryan Held (42.44 leadoff), David Williams (42.36) and Soeren Dahl (43.14) on the squad. Out of that same Cal-NC State heat came Michigan, the fourth qualifiers. The Wolverines capped off a great prelims with a 2:50.14, getting a 41.54 from anchor Bruno Ortiz, who really showed up to swim this morning. The defending champs from Auburn are all the way back in the 5th spot after going 2:50.49. The Tigers were ultra-consistent with three guys going 42-mids: Peter Holoda (42.51), Michael Duderstadt (42.41) and Kyle Darmody (42.53). Stanford used yet another giant David Nolan split to take sixth in 2:50.52. Nolan was 41.50 as he continues to lift Stanford into contention for the top 6 team spots overall. 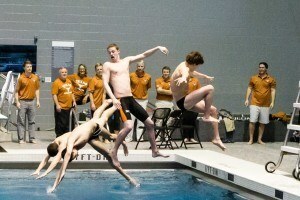 Texas barely snuck into the A final in 7th, not using Jack Conger in prelims. Kip Darmody led the way with a 42.44 split on the anchor leg. Also into the A final are the Cardinals of Louisville, with Trevor Carroll splitting 42.60 to help the team go 2:51.48 for 8th place. Breaststroker Thomas Dahlia was also 42.65 on his split. Just on the outside looking in is Alabama, despite a 41.96 from Kristian Gkolomeev. ‘Bama was 2:51.66 and will join Ohio State (2:51.67 with a 42.20 from Michael Disalle) in the B heat. The early heats of the 1650 freestyle will take place this afternoon between prelims and finals, with the top 8 seeds swimming as the opening event of tonight’s finals. Has anyone won 2 individual events yet? Murphy, Cordes, Dressel have shots today. I think Cordes has gotten it the past 2 years because he broke NCAA records, even though his schedule wasn’t as heavy as other swimmers. Since he didn’t break the 100 (we’ll see about the 200), I think they’ll go somewhere else. Whoever gets win #2 today should get it. I think Murphy, after his 100 back and a possible 1:36 tonight…thoughts? 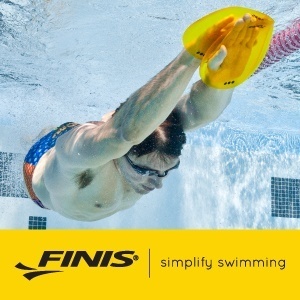 Team SwimSwam was debating this last night. Nobody has doubled yet. David Nolan might be the best candidate right now even with just one win – he’s got the only individual American record so far and that 200 IM was a hugely memorable swim. Conger could match Nolan today if he breaks his own 200 fly record. That said, if Murphy wins and breaks the record in the 200 back tonight, it’s probably him. Quintero — if he wins the 100 free (admittedly a long shot) and puts up a strong leg on a winning 400 free relay for USC (a possibility) — would also merit consideration. Two wins, two winning relays. What about Will Licon? He wont the 400 im, He has a big chance to upset Cordes tonight, and he got silver in the 200 IM behind Nolan. He has my vote 100%. This may be a silly question but why isn’t Conger’s 200 Fly time the NCAA record? I understand why it’s not the Championship record, but shouldn’t it be the NCAA record? 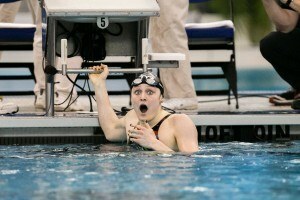 Amy – Conger’s swim was done in a time trial, which apparently didn’t officially count as an NCAA swim.